Given more than 60 pages to fill, the creators of Uncanny X-Men #11 faced an interesting question: Get a jump on the story by combining multiple issues into one, or expand one issue and make it something special? They went with the latter option. While I think the move was successful, I'm not sure if most X-fans would agree it's $8 successful - especially not following on the heels of the wallet-straining excess of Disassembled. What we get is a frustrated Cyclops re-engaging with a world that hates and fears mutants more than ever - a world without X-Men. His explorations paint a grim picture of that world, and at his lowest ebb, he unites with Wolverine for a big, cathartic fight against some classic enemies. That's the first half of the issue. And if it stopped right there, it'd be a satisfying start, well worth $4 or even $5. But Uncanny #11 keeps going. We rewind to see what Wolverine was up to before teaming up with Cyclops. And then we rewind again to fill in some last heartbreaking holes in Blindfold's story. And once it's all over, the question of how to rate this comic - and deciding whether or not it's worth eight dollars - gets complicated. The character work is pretty good. Cyclops and Wolverine are presented with clear, familiar tones, although their actions say more than their words at this point. The heaviest lifting is, surprisingly enough, handled by Blindfold. She shares some terribly ominous predictions, and her story paints a dark portrait of what's coming for the X-Men and mutants in general. The art is rich and dense. Each story features heavy shadows, a move that perfectly suits the issue's tone. Moving from protagonist to protagonist makes the transition through multiple visual styles much less jarring than it could be. Seeing many of the issue's key moments unfold from multiple perspectives is enlightening. We only get one take on the climactic fight, though, and that comes off a little stilted. The colour palette is interesting. Many (most?) of the scenes are washed out, reflecting the almost post-apocalyptic mood the story aims for. Powerful reds are a big exception - Cyclops's blasts, as you'd expect, light things up. But Blindfold's ominous, ambiguous visions are also cast in red shades. Her words explicitly suggest that Cyclops may play a causative role in disasters to come; is the palette being used to double down on that suggestion? The rear half of Uncanny X-Men #11 definitely makes positive contributions to the reading experience. It continues the job of defining the world Cyclops and Wolverine will be operating in. And the Wolverine story is probably the most purely enjoyable bit of the whole book. But these "bonus extended cut" stories have a dark side. They drain away the marvellous momentum Cyclops's story built in the front half. They turn this into another "big picture" X-Men story, which is not really what the doctor ordered as a chaser to Disassembled. 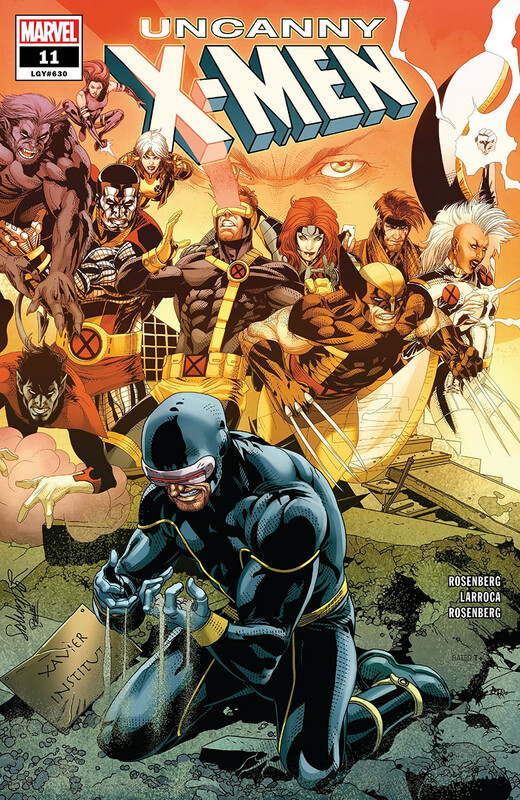 Uncanny X-Men #11 is the first big chapter in another big X-Men saga. While its storytelling is respectably above average and it delivers a fair share of dark surprises, its great length compromises the effectiveness of its "keep reading" hook. That hook is buried in the middle, and the risk of it losing its hold on you by the end is all too great. Conflicted as I might be about this issue overall, I definitely felt the first "SNIKT" was a big hoo-rah moment.